In the last few posts, I’ve wanted to share some of the big topics of discussion around gentle living. First up was a topic that is high on many of our agendas: decluttering our tech for a more gentle life. Second was re-thinking what a more gentle life really looks like, so that we’re not afraid to look perfect or even gentle on the outside and today is the third video in the series. 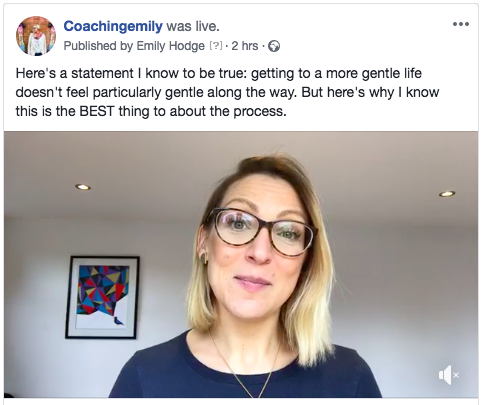 In this discussion, I’m sharing something that’s really hard to admit – that getting to a gentle life is actually not very gentle. But…but, I’m sharing why this is the BEST thing to know and why it actually really helps in starting the process. You can watch (or listen) to it here now. Please enjoy – the journey as much as any ending we might hope for. You can now join my latest challenge supporting leaders and influencers to lead more gentle and successful lives to enable you to mindset shifts that help you in your business and home life alike. Pressure to look gentle – is it stopping us from trying?